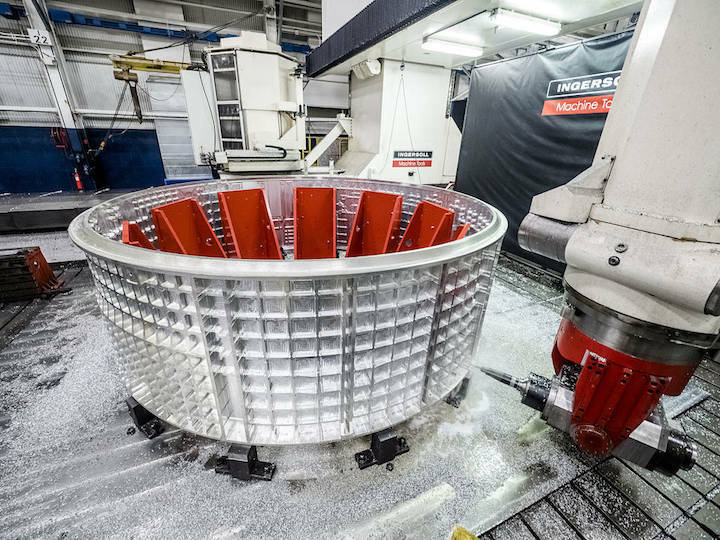 Machining for NASA's Orion spacecraft, scheduled to fly on the second integrated flight with agency's Space Launch System rocket, is well underway at Ingersoll Machine Tools in Rockford, Illinois. The new deep space spacecraft will take humans farther into the solar system than we have ever traveled before. 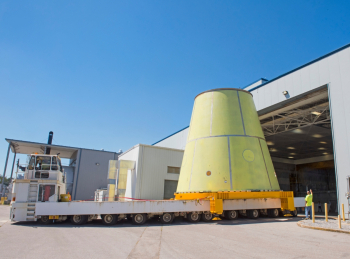 Seen here, the barrel of Orion's crew module, which arrived at the facility weighing about 12,000 pounds, will be reduced to approximately 880 pounds before it is shipped to NASA's Michoud Assembly Facility in New Orleans. Four of the crew module's parts are being machined at Ingersoll before they ship for welding and assembly this summer. The crew module is the part of the spacecraft where astronauts will live, work, exercise and eat during their missions beyond the moon. 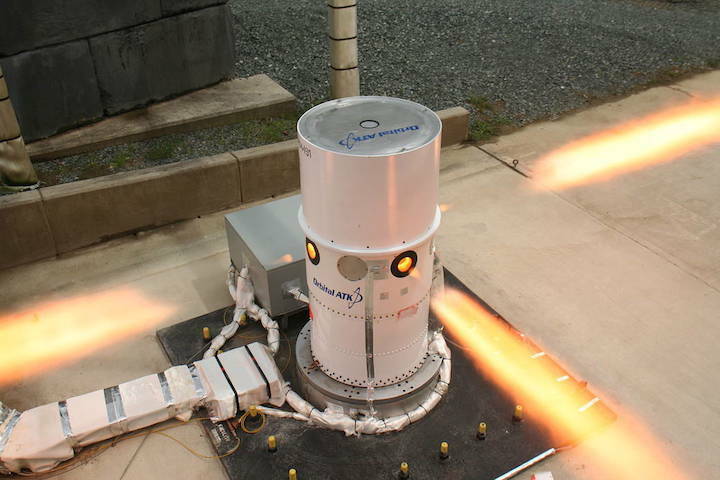 Engineers at Orbital ATK’s facility in Elkton, Maryland, recently completed a successful test of the Orion Launch Abort System motor designed to steer the astronauts away to safety in the unlikely event of an emergency. The Launch Abort System includes three motors, and the motor tested was the attitude control motor. This motor consists of a solid propellant gas generator, with eight proportional valves equally spaced around the outside of the three-foot diameter motor. Together, the valves can exert up to 7,000 pounds of steering force to the vehicle in any direction upon command from the Orion spacecraft and are designed to safely steer Orion after an ascent abort. 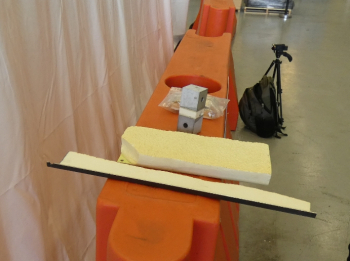 This is a critical safety enhancement of Orion for our journey to Mars. The test was a success thanks to the collaborative efforts of NASA, Lockheed Martin and Orbital ATK. 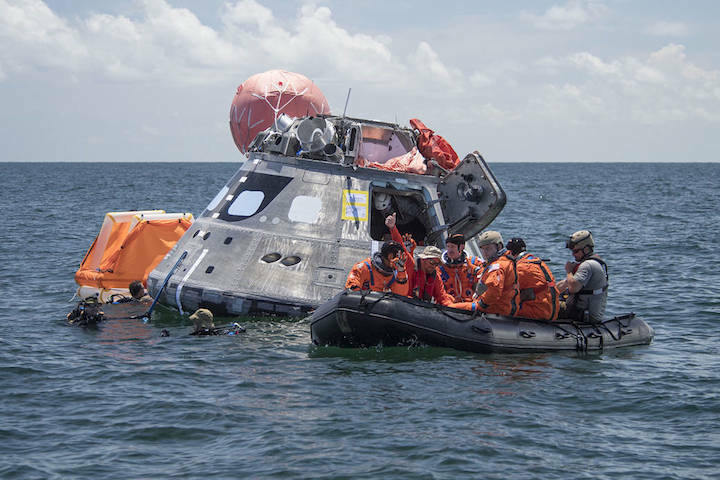 When astronauts return to Earth from destinations beyond the moon in NASA’s Orion spacecraft and splashdown in the Pacific Ocean, they’ll still need to safely get out of the spacecraft and back on dry land. Using the waters off the coast of Galveston, Texas, a NASA and Department of Defense team tested Orion exit procedures in a variety of scenarios on July 10-14, 2017. 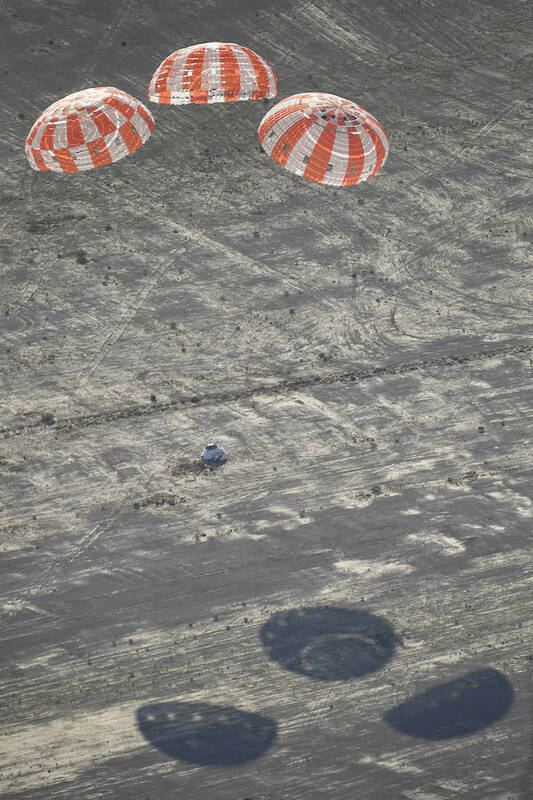 Orion’s three main orange and white parachutes help a representative model of the spacecraft descend through sky above Arizona, where NASA engineers tested the parachute system on Sept. 13, 2017, at the U.S. Army Proving Ground in Yuma. NASA is qualifying Orion’s parachutes for missions with astronauts. During this test, engineers replicated a situation in which Orion must abort off the Space Launch System rocket and bypass part of its normal parachute deployment sequence that typically helps the spacecraft slow down during its descent to Earth after deep space missions. The capsule was dropped out of a C-17 aircraft at more than 4.7 miles in altitude and allowed to free fall for 20 seconds, longer than ever before, to produce high aerodynamic pressure before only its pilot and main parachutes were deployed, testing whether they could perform as expected under extreme loads. Orion’s full parachute system includes 11 total parachutes -- three forward bay cover parachutes and two drogue parachutes, along with three pilot parachutes that help pull out the spacecraft’s three mains. While NASA's massive Space Launch System won't be taking off from Cape Canaveral until at least 2019, its engines are close to ready. The four RS-25 engines that have been assembled and tested in the past year at NASA's Marshall Space Flight Center in Huntsville, Alabama will now be sent to NASA's Michoud Assembly Facility in New Orleans to be hooked up with the massive core stage and tested before it all makes its way to Kennedy Space Center. 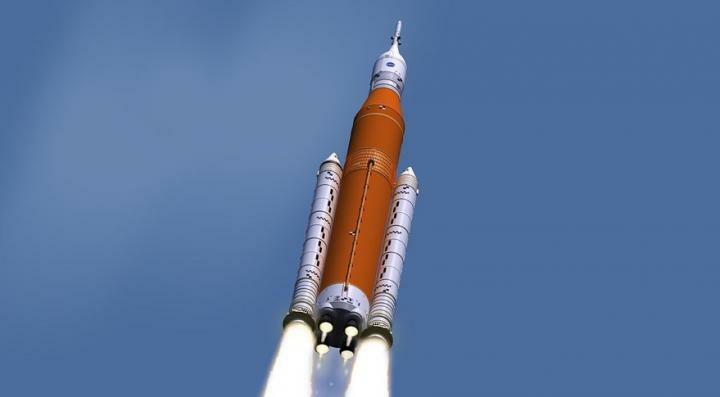 “NASA’s priority is to deliver hardware for the first flight of the Space Launch System and Orion spacecraft,” said John Honeycutt, SLS program manager at Marshall Space Flight Center. All four RS-25 engines that will power SLS for its first flight are ready to be integrated with the rocket's core stage. 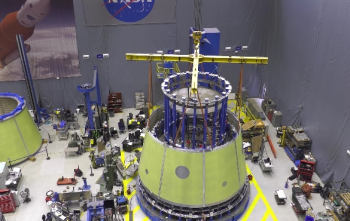 They will be sent to NASA’s Michoud Assembly Facility in New Orleans where they will be attached to the core stage before a green run test that will verify that the system is ready for flight. The engines are the leftovers from the space shuttle program, having been flown on 21 missions, but now upgraded to support the new NASA rocket that will launch the Orion crew capsule. Before they head to Kennedy, the engines will undergo torque testing, leak checks, and an avionics software check. No manned launch of Orion will take place until at least 2022, but more likely 2023. 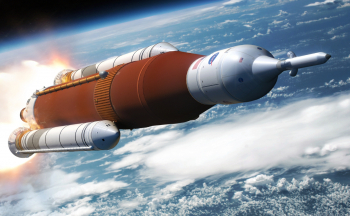 The unmanned Exploration Mission 1 for the Space Launch System is planned no earlier than 2019. The four engines headed to New Orleans are part of 16 engines that helped support the 135 missions of the space shuttle era. 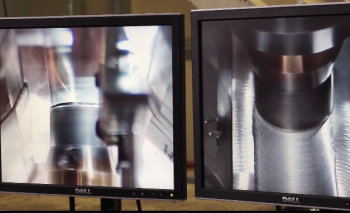 Several have been used for testing in the last year to ensure new controllers work properly. 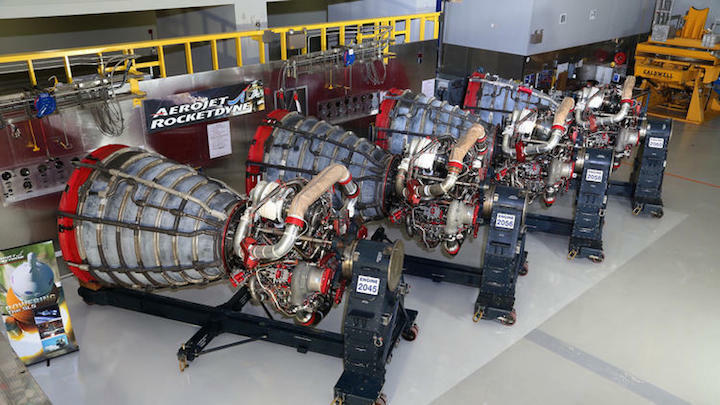 NASA has also ordered six new RS-25 engines from Aerojet Rocketdyne for use in future missions. Meanwhile, the core stage that will be taller than a 20-story building and hold more than 700,000 gallons of propellant, is in production, with the welding completed on its liquid hydrogen tank marking the last of its five parts that will now be assembled. Those also include the liquid oxygen tanks, engine section where the RS-25 engines will be housed, the intertank and the forward skirt. 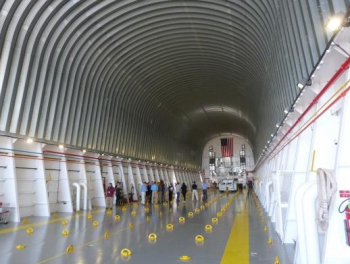 A full-scale mockup of the core stage has also been produced to ensure everything goes smoothly for when the actual core stage is ready for transportation to Kennedy Space Center via barge. The mobile launch platform was originally built for NASA’s Constellation program conceived under the George W. Bush administration, in which astronauts would have launched on missions to the International Space Station, and eventually the moon, atop Ares 1 rockets derived from the space shuttle’s solid rocket boosters. The towering structure stands nearly 400 feet tall and weighs 10.5 million pounds, and it was finished in 2010, the same year the Obama administration canceled the Constellation moon program after development costs soared. The Obama White House and Congress agreed on a new path for NASA’s human spaceflight program, which included turning over responsibility for missions to Earth orbit to the commercial sector and designing and building the SLS heavy-lift rocket, a huge launcher powered by surplus shuttle-era liquid-fueled engines and solid rocket boosters. The SLS is being built to transport astronauts into deep space, perhaps initially to a miniature space station near the moon, then to the lunar surface and on to Mars, according to NASA’s long-term plans. 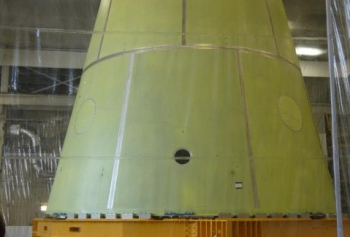 Crews fastened inside Orion capsules will blast off atop the Space Launch System. NASA decided to modify the Ares rocket’s mobile launch platform for the SLS, upgrades that included cutting new holes in the structure’s two-story-tall base to accommodate the heavy-lift launcher’s core stage engines and twin side-mounted boosters, instead of the single-stick Ares 1 configuration. Those large-scale structural changes are now largely complete, and work to install swing arms to the platform’s tower is now underway. The walkway for astronauts to board the Orion crew capsule is next to be lifted into place on the mobile launch platform. 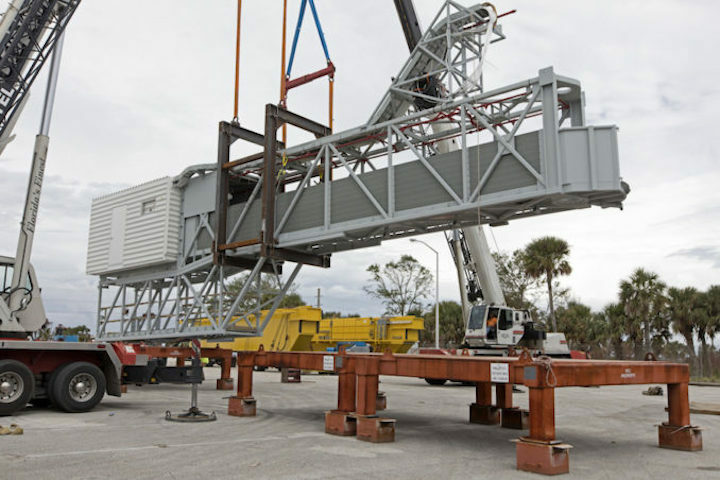 The crew access arm arrived at the Kennedy Space Center earlier this month, where it is being stored in a parking lot until it moves to mobile launch platform’s worksite just north of the iconic Vehicle Assembly Building. A crane will soon hoist the crew access arm to the tower’s 274-foot-level, where crews will connect it to the structure with a hinge. 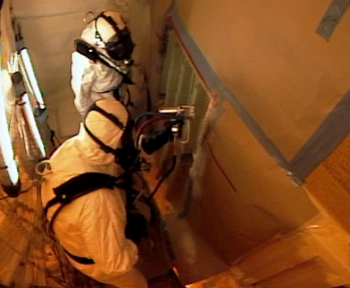 The appendage includes a white room, where astronauts will prepare to enter the Orion capsule’s hatch. Earlier this year, construction crews installed the Orion Service Module Umbilical, which will connect the spacecraft’s propulsion and power section with ground supplies of electricity and liquid coolant. 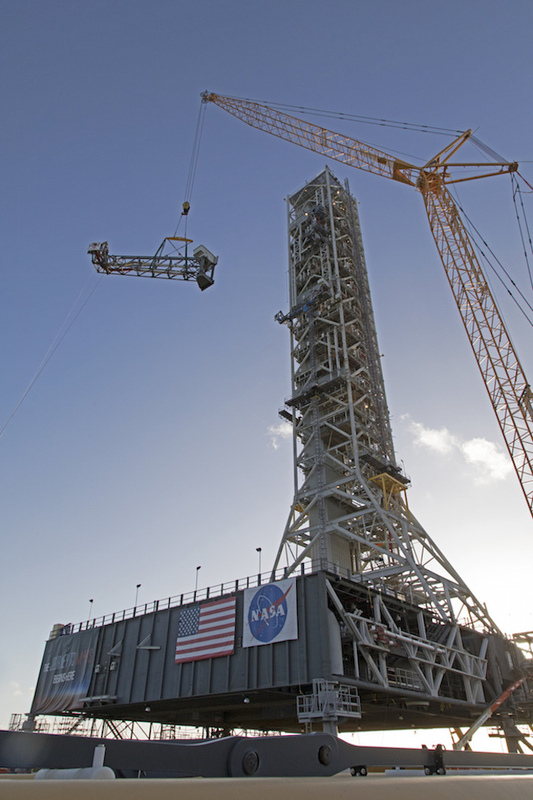 A swing arm with the SLS Core Stage Forward Skirt Umbilical — designed to provide conditioned air and gaseous nitrogen to the upper part of the first stage — was attached to the tower’s 220-foot-level in June. The platform’s Aft Skirt Electrical and Pneumatic Umbilicals have also been added to the mobile launch platform where the solid rocket boosters will be located, and workers earlier this month hoisted the SLS Core Stage Inter-tank Umbilical for a fit check. It will be permanently installed in the coming months to provide connections to the first stage between its cryogenic liquid hydrogen and liquid oxygen propellant tanks. 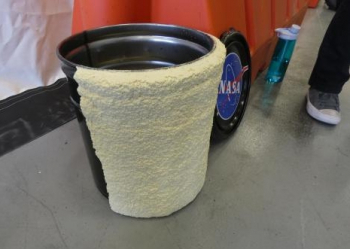 The inter-tank umbilical’s primary function is to vent excess gaseous hydrogen from the rocket’s core stage, NASA said, along with providing conditioned air, high-pressure gases, power and data to the core stage. 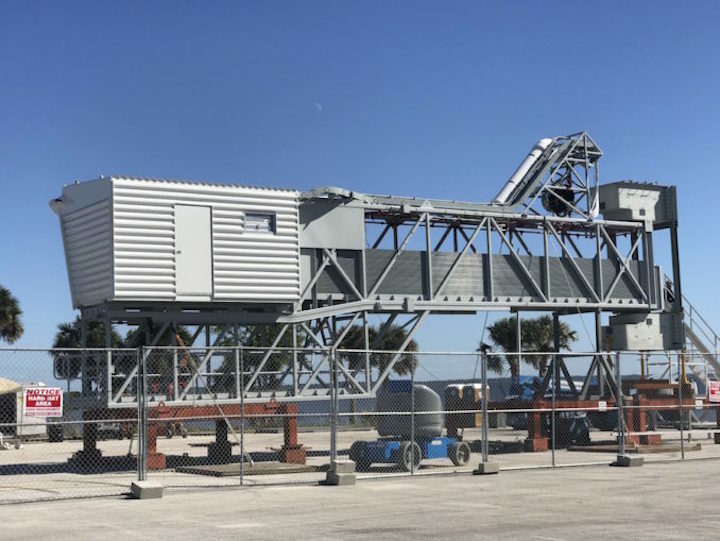 Items still to be added to the mobile launch platform include the Vertical Stabilizer, which will help protect the 322-foot-tall (98-meter) rocket from winds. An umbilical line to feed propellants into the SLS upper stage — called the Interim Cryogenic Propulsion Stage — is also planned for installation. The first SLS test flight, known as Exploration Mission-1, will use an upper stage originally designed for United Launch Alliance’s Delta 4 rocket with a single RL10 engine. Construction crews Tail Service Masts will also be fitted to the platform’s base to route cryogenic propellants to the SLS first stage. Engineers are testing the umbilical connections at a separate KSC facility to demonstrate how the lines will disconnect and pull back from the SLS at or just before liftoff. 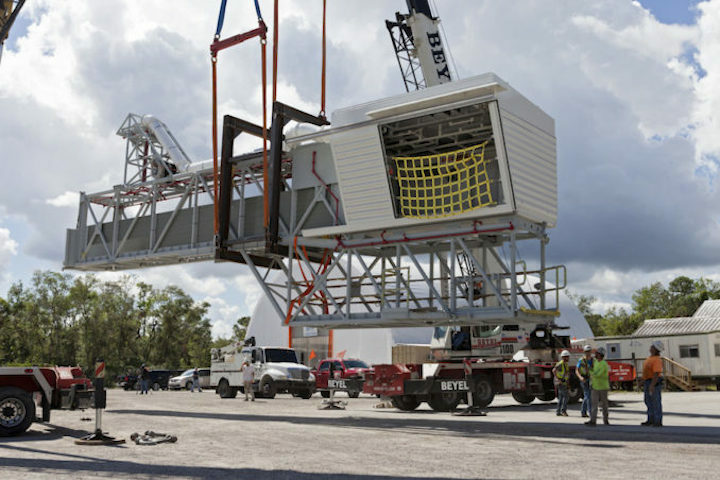 Once the mobile launch platform is ready, engineers will move it inside the VAB for further testing. Exploration Mission-1’s target launch date was expected to occur this year when the SLS program was announced in 2011, but is now scheduled no sooner than late 2019. NASA is expected to announce a more specific timeframe for the flight in the coming weeks. The test flight will be the first for the Space Launch System, and the second for the Orion spacecraft after a shakedown cruise in Earth orbit in December 2014. A rocket of SLS’ size is required to send the Orion spacecraft to more distant destinations, and the flight plan for EM-1 calls for the capsule to fly into a high-altitude orbit around the moon for a planned three-week mission. EM-1 will not carry any astronauts. That capability will debut with Exploration Mission-2 in the early 2020s, after engineers complete development of Orion’s life support system and cockpit controls, along with a more powerful four-engine upper stage for the Space Launch System. 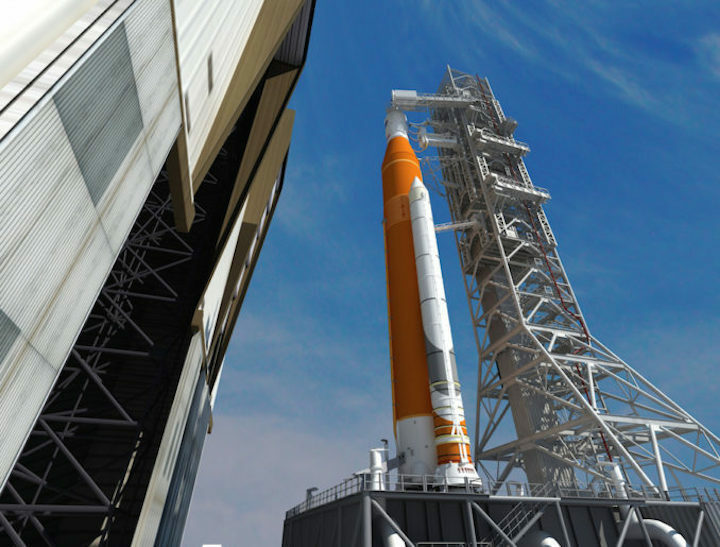 The upgraded SLS will need a redesigned mobile launch platform because it will stand around 40 feet (13 meters) taller than the rocket slated to fly on EM-1. Construction crews will need to fabricate new umbilicals and reposition others on the tower, a process expected to take a couple of years. Meanwhile, preparations for the inaugural Space Launch System flight are also progressing inside the Vehicle Assembly Building and at launch pad 39B. Ten new work platforms were installed inside the VAB high bay that will house the SLS during its build-up and assembly, replacing equipment that was tailored for the space shuttle. At pad 39B, construction workers installed the last of about 96,000 heat-resistant bricks inside the north side of the flame trench in May. The bricks are built to withstand temperatures of up to 2,000 degrees Fahrenheit from exhaust generated by the SLS core stage engines and solid rocket boosters. Current work at pad 39B involves the positioning of a new flame deflector under the launch mount to redirect all of the rocket’s exhaust to the north side of the pad. That is a change from the pad’s shuttle-era configuration, in which exhaust was routed to both the north and the south. Once the Space Launch System is fully stacked inside the VAB, one of NASA’s Apollo-era crawler-transporters will transfer it to pad 39B for final countdown preparations. NASA is performing a series of tests to evaluate how astronauts and ground crew involved in final preparations before Orion missions will quickly get out of the spacecraft, if an emergency were to occur on the pad prior to launch. 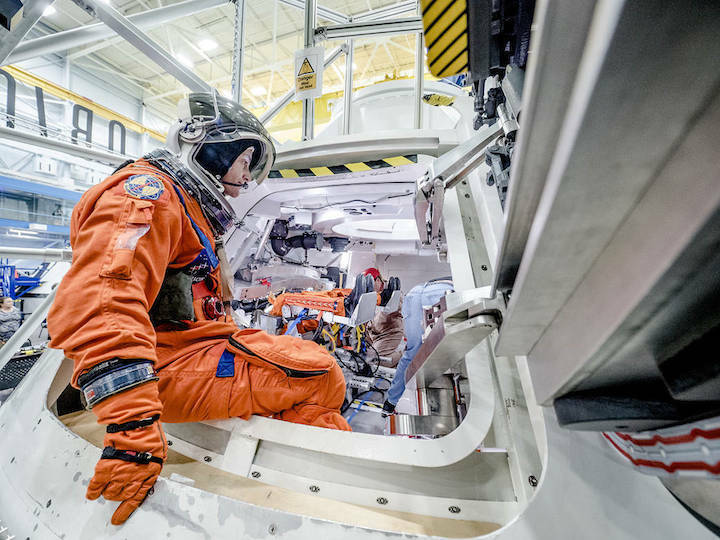 This testing took place the week of Oct. 30, 2017, using the Orion mockup in the Space Vehicle Mockup Facility at NASA’s Johnson Space Center in Houston. In this photo, engineers used fake smoke to imitate a scenario in which astronauts must exit the capsule when their vision is obscured. The first crewed test flight for the Orion spacecraft and Space Launch System rocket, Exploration Mission 2 (EM-2), is targeted to launch from NASA’s modernized spaceport at the Kennedy Space Center in Florida in 2021. The mission’s primary goals are to demonstrate Orion’s crew capabilities and the upgraded SLS rocket. Smith’s remarks showed a clear frustration with delays, largely due to technical issues with SLS and Orion, that have pushed back the Exploration Mission (EM) 1 launch from 2017 to no earlier than December 2019. NASA announced the 2019 date a day before the hearing, while acknowledging that technical reviews concluded that June 2020 was a more likely launch date. Smith, who announced Nov. 2 he would not run for reelection next year after more than three decades in the House, including serving as chairman of the science committee since 2013, warned about eroding support for the programs should there be additional delays. Smith’s comments represent one of the strongest rebukes to date by a leading member of Congress regarding progress on SLS and Orion. Other members of the committee expressed few, if any, reservations about the programs at the hearing despite the latest delay. Babin noted the delays but also highlighted the “significant progress” the overall exploration program has made. He offered his own warning, though, to the agency and companies working on the program. “NASA and the contractors have to execute. Failure to do so could have dire consequences for the program, and there will be no one else to blame,” he said. 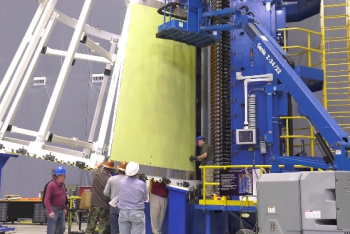 Bill Gerstenmaier, NASA associate administrator for human exploration and operations, said that NASA had overcome the issues with welding on the SLS core stage that delayed its progress. The agency is helping the European Space Agency on the Orion service module, another source of delays, such as providing NASA support for an American-built helium valve for the module that has been experiencing manufacturing problems. One lesson from these problems, he said, was that program schedules didn’t provide adequate time to deal with issues that arose as NASA and companies went through the construction of SLS and Orion for the first time. “I think we just need to be prepared, as we build schedules going forward, to know that these first-time things that we have never done before, or at a magnitude that has never been done before, may need a little bit of extra time that first time through, and not be overly optimistic in our schedules,” he said. In an interview after the hearing, Gerstenmaier said there was no specific confidence level associated with the December 2019 launch date that NASA said Nov. 8 it was managing to for the EM-1 launch. Instead, he said the date provided focus for those working on SLS, Orion and their ground systems.